Jockey Sport Microfiber Active 2-pack boxer trunk, slightly longer in the leg, the Sport Microfibre boxer trunk has been designed as the underwear of choice for men living an active, sporty lifestyle. The boxer is ideal for a range of sports including cycling and running / walking where chafing can be a problem. The range features great value 2-pack slip briefs, trunks and T-shirts. 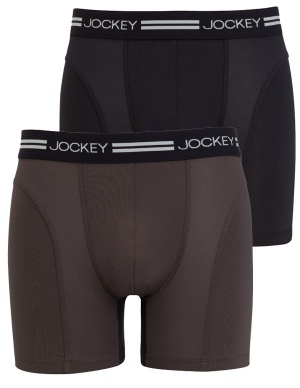 Although this Jockey range has been designed to be worn for sporting activities, the underwear is also suitable for everyday wear as the fabric mix is extremely soft and comfortable with excellent moisture management by virtue of the clever use of mesh inserts. Definitely the most I've paid for underpants, but worth every penny. Well made and extremely comfortable. Perfect for walking. Nice smooth line, comfortable pants that's what my husband has said.